Put the flour into a food processor with the butter and whizz for a few seconds to breadcrumb stage. Add the ground almonds, egg and 2 tbs of the sugar, then whizz again until the mixture forms into a ball. Turn out, wrap pastry in cling film and chill for 30 mins. Set the oven to 200°C/Gas Mark 6. Using a floured rolling pin, roll out the pastry on a large sheet of floured baking parchment to a circle about 30cm (12in) in diameter. It’s very soft pastry, so don’t worry if it doesn’t roll out perfectly. Ease the parchment on to the baking tray. Sprinkle the centre of the pastry with breadcrumbs and thickening granules. 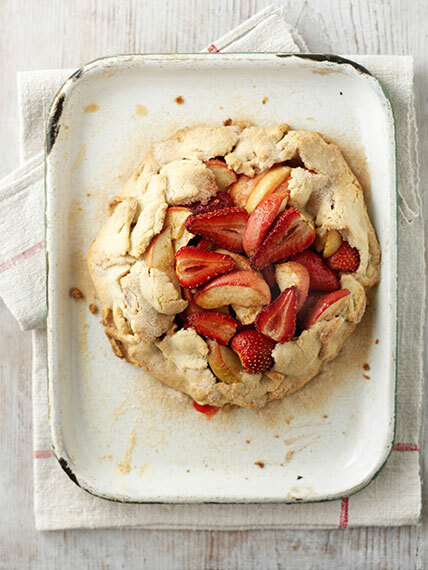 Pile the prepared apples and strawberries on top, leaving a wide border, and sprinkle over the cinnamon. Gather the pastry up and over the fruit. Sprinkle with the rest of the sugar. Bake for 35-40 mins, until the pastry is golden and the fruit is tender.